One of the most important advantages of purchasing and using the American Red Cross FRX3 Radio is that it is an affordable alternative that is perfectly capable of doing what it is supposed to do. The model has been praised time and time again for its performance and features, and we’ve come across countless positive reviews on the part of American and international customers. If you’re looking for a relatively inexpensive weather alert radio, this is the one to get. All things considered, the single issue of this model seems to be battery life. However, this is not a deal-breaker for most buyers, as the unit manages to last around 5 days in standby mode. According to a consumer, charging the model via solar power requires direct sunlight on the panels, but the hand crank works very well. The radio can be used for charging a mobile phone, but since it is so power-hungry, the cell phone might drain the radio battery. As is the case with other products we have analyzed, the American Red Cross FRX3 Radio manages to work with a variety of frequencies, including AM/FM and the seven National Oceanic and Atmospheric Administration weather band stations. The radio features an Alert system which provides relevant info regarding tornadoes, storms and hurricanes, whenever the function is turned on. If you ever feel like utilizing the unit without the capabilities of a weather/alert radio, you may do so by deactivating the formerly mentioned function. Thanks to the American Red Cross FRX3 Radio, families can finally remain safe and sound, even in areas that are prone to disasters. 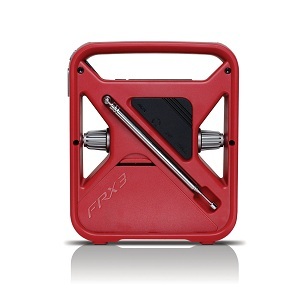 Even though some consumers have reported that the battery life of this unit isn’t exactly excellent, spinning the hand turbine for a single minute allows users to listen to the American Red Cross FRX3 Radio for up to 15 minutes. In hard times, this is a net advantage, as are all the other ways the model can be charged. For example, the model is compatible with standard AAA batteries and DC power alternatives. A mini-USB cable is included in the package, which allows buyers to charge their mobile phones from the radio. The American Red Cross FRX3 Radio does wonders while one is on a camping trip, as it can provide truly crucial information regarding the weather in the area, charge a mobile device and even play some music around a nice fire. This is one of the smallest weather radios on the market today. It measures just 6.9 inches by 5.8 inches by 2.6 inches and weighs in at 0.93lbs. Even if it is so compact, the item is packed with all the features one might ever require during a disaster. 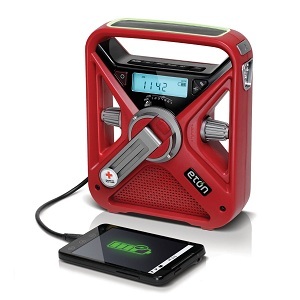 The American Red Cross FRX3 Radio can be used as an alarm clock and even as a flashlight. Thanks to its dimensions, the unit can be always kept in the car, at the office or at home. Better safe than sorry seems to be the whole idea behind this model.